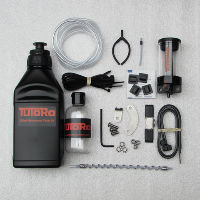 A product well worth recommending for the tourer with a chain drive machine. This product will take the hassle out of touring. Why not order your chain oiler and oil from us ready for your next tour. Prices do not include postage and if you are local I will help you fit at no extra cost. No problem with spares for this piece of equipment. All parts are available separately. Contact us for details in the unlikely event that you will need to replace something. Our picture shows the unobtrusive oil reservoir that is part of the deluxe kit that comes complete with 500m of oil, a top up flask and the twin feed oiler . All this for £89.00 (excludes postage). Postage is an extra £2.95. 500 ml of chain oil. 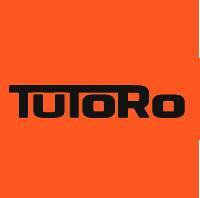 Specially formulated for use with the Tutoro chain oiler. Cleans and lubricates. Price inclusive of VAT £8.99. Postage is an extra £2.95.